I am always on the hunt for some tasty side dishes that I'm actually going to make. Because as much as I love me some grilled steak or chicken (especially in the summer time), it's just not a complete meal without a couple of side dishes to compliment those smokey flavors and satisfy every craving. In addition to being delicious, I'm always trying to come up with sides that are realistic. Ones that don't take tons of time and ingredients to make, but are still full of nutrients and homemade goodness? That's what I'm talking about! 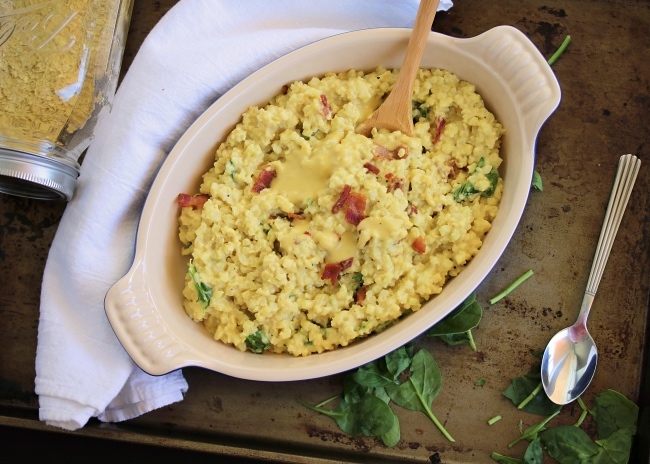 This "cheesy" cauliflower rice absolutely ticks all of those boxes. It's creamy, filling, and the perfect compliment to a juicy grilled steak and a fresh salad. And with all of the options in terms of mix-ins, you could even turn this side into the main event as a full meal. Stir in some shredded chicken & diced green chiles with a dash of taco spice, and this is a one-dish comfort meal at its finest! My favorite part about this creamy dish? The fact that it's SO darn easy to make. I steam the cauliflower in the microwave (because, ya - I still use the microwave... I'm not the only one, right?) It takes just minutes, while I quickly whisk up the simple "cheese" sauce over the stove. Mix it all together - and you're done! Now don't be alarmed by the word cheese in quotes... it's just to let you know that although this has tons of delicious cheesy flavor, it's still dairy-free. I start the sauce the same way you would a homemade cheese sauce, then skip the actual cheese and stir in nutritional yeast. It's becoming so much easier to find (we got ours at Trader Joe's this time) and is super easy to mix in to recipes for tons of cheesy flavor. 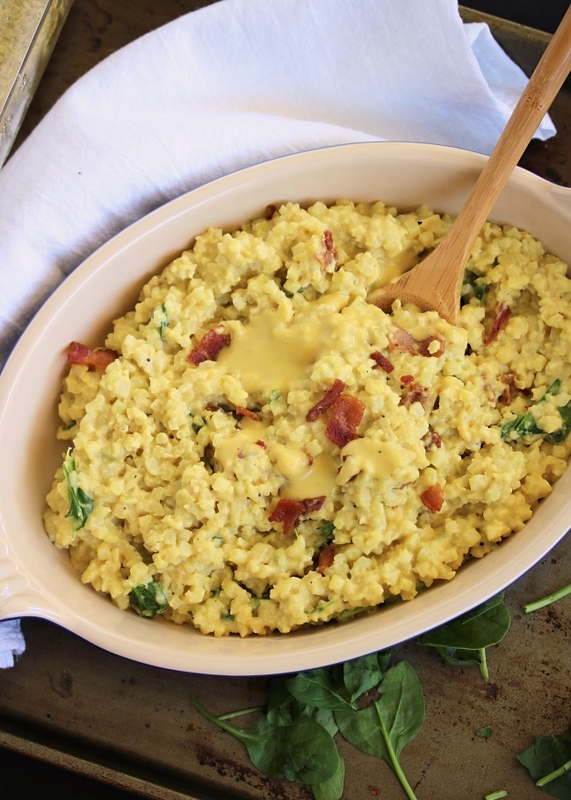 This comfort-food dish is so tasty and addicting, you might be tempted to chop up some hotdogs and eat it in your favorite old plastic bowl (okay - maybe the hot dog mac n' cheese dish really was just me). Hope you enjoy this side as much as we do. I'd love to hear what you serve it with, and if you try any mix-in combinations! optional mix-ins: chopped bacon, baby spinach, green onion, minced garlic, shredded chicken, sliced jalapeños, diced green chiles, chopped ham, etc! 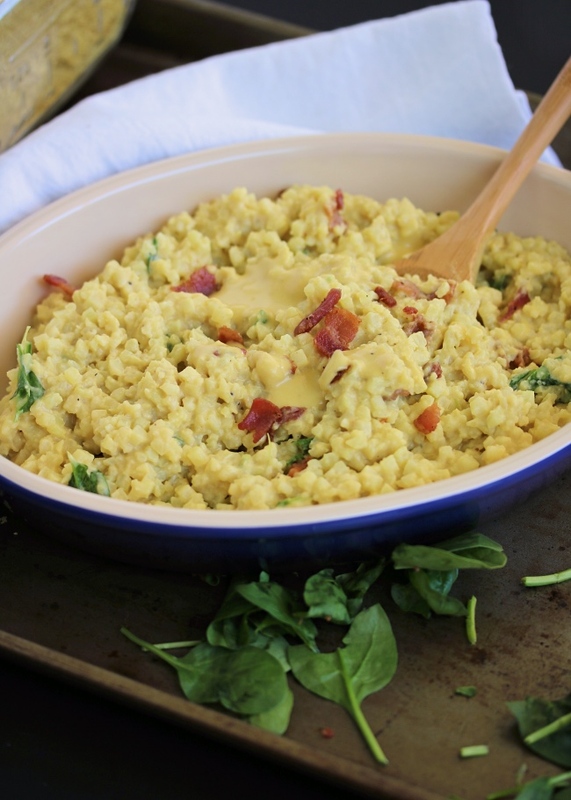 Steam the cauliflower rice*. I cook mine in the microwave, in a microwave-safe bowl covered with a paper towel. Simply heat for about 4 minutes until softened and heated through. In a medium saucepan, melt the butter or ghee. Stir in the almond flour until it thickens to a paste texture. Slowly whisk in the coconut milk. Add the seasonings and nutritional yeast, and stir until combined and slightly thickened. Transfer the steamed cauliflower to the pot of cheese sauce and stir until combined. Add whatever mix-ins you like, and transfer to a serving dish. Serve hot! If you're not a fan of using the microwave, you can easily steam your cauliflower rice over the stovetop. Just place the riced cauliflower in a medium saucepan with 2 tbsp of water. Cover with a lid, and cook on medium. Stir occasionally, until the cauliflower is softened and heated through. Is the coconut milk full fat in a can? Looks great can't wait to try. I typically use a reduced fat or "light" version but full fat would work too! Just be sure to get a little of that water in there with it, instead of just the cream at the top. this is very useful informative posting ! thank you for your sharing this good informations ! 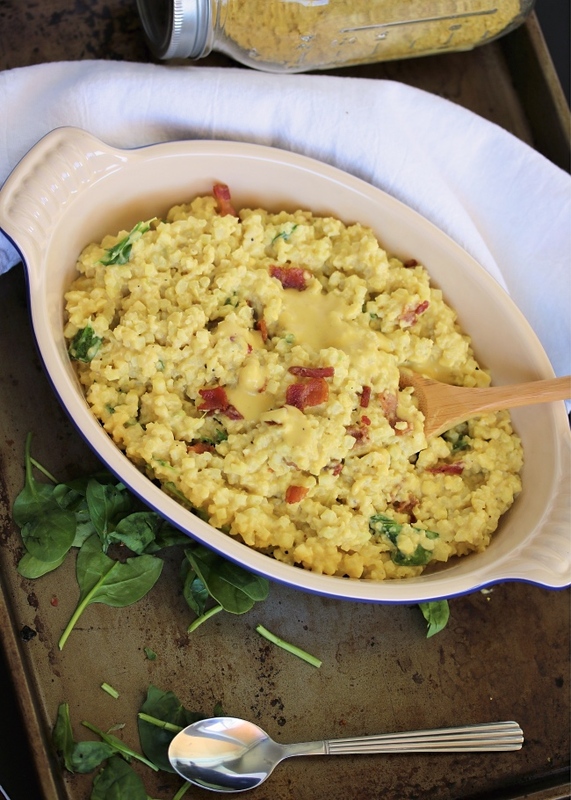 This is super easy and tastes so rich and delicious! Served it with andouille sausages. Thanks for Another wonderful recipe! Thanks Agustina!!! I will keep vegan alternatives in mind for other recipes in the future because I know that’s important to lots of people!! if we use ghee, this can be whole30 compliant correct? Can you sub arrowroot powder for the almond flour? I made this tonight and I did not have almond flour, so I subbed tapioca flour and it turned out amazing!! It tasted so delicious and it came together so easily! Thanks for sharing the recipe! Hi Bethany & Heather! I haven't tried this with all different flours, only with almond & coconut. It's a small enough amount that it should work fine- but I can't vouch for it! Chanté- I'm so happy you enjoyed it and SO helpful to know that tapioca flour worked out well for you!! Thanks so much for reporting back!